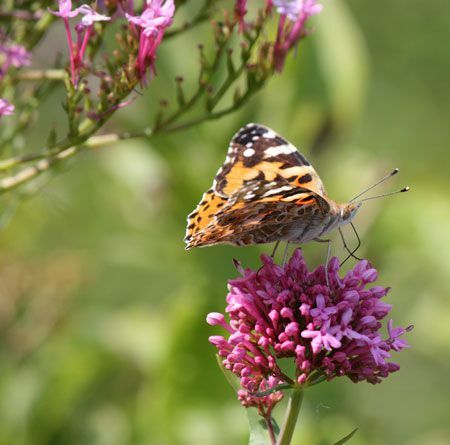 A migratory butterfly, the painted lady (or cosmopolitan butterfly) lives and reproduces in North Africa. During the spring entire populations travel to Northern Europe where they give birth to one or sometimes two generations of butterflies, some of which will return to the North Africa for the winter...a journey that can cover several thousand kilometres! In 2009 a massive emergence of this species led to many observations throughout Europe and particularly in France where several hundred individuals were counted in some places in just a few dozen minutes. Widespread throughout Europe its numbers vary depending on the year. This species is very well represented in France. Number of generations per year: 2 to 3. Appearance: tawny to pink tones on the top side of wings, black edges of the fore wings tinged with white. The hind wings are bordered with several rows of black points. The underside of the wings are brightly coloured with tawny and whitish blotches, blue spots and tinged with pink on the fore wings. Ribbed and beige-coloured eggs are laid one by one on the upper face of the leaves of the host plant. Size: 30 mm during the last stage. Appearance: hairy, its colour varies from yellow to black. A more or less continuous cream line extends along its sides. Its head is black. Host plants: over thirty different host plants have been referenced in Europe such as thistle (Echinops ritro, Carlina acanthifolia, Cirsium vulgare or even Cirsium arvense), artichokes (Cynara scolymus, Cynara cardunculus), mallow (Malva sylvestris), asters (Helichrysum stoechas), borage (Borago officinalis), blueweed (Echium vulgare) or even the plantain (Plantago lanceolata). Beige and angular with golden glints, it fixes itself to its support using an appendage that forms hooks: the cremaster. Small spikes can be observed on its back.